You are at:Home»Editorial»Aveo Chairman: “It was a year not without challenges”. Established unit sales down 38%. Security price down 20%. Medium-term recovery. Aveo Chairman: “It was a year not without challenges”. Established unit sales down 38%. Security price down 20%. Medium-term recovery. “It was a year not without challenges but the leading position that we have built in Australia as a pure retirement group ensured we were well equipped to manage these changes”. “For the 12 months to 30 June 2018, we recorded an underlying profit after tax and noncontrolling interest of $127.2 million, up 17% on the $108.4 million recorded in FY17. At a statutory level, our FY18 statutory profit after tax was up 44% to $365.1 million”. “Despite this, our security price is trading at a significant discount to NTA. We believe this is due to concern around sustainable sales levels in a broader property market that has softened and perceived further regulatory risk in the retirement sector. 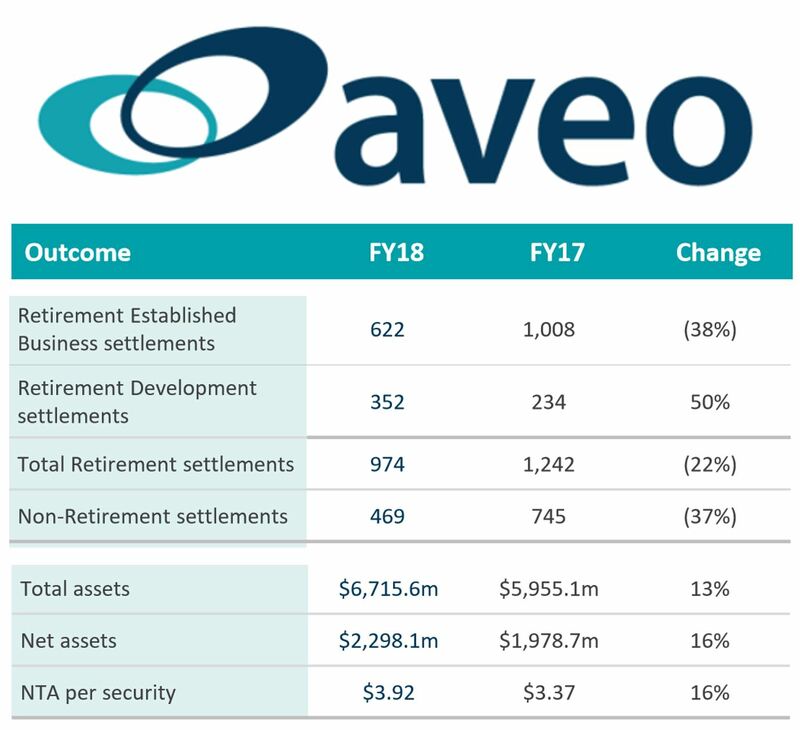 We believe these concerns are outweighed by the strong medium to long-term growth prospects for the retirement sector in Australia and the significant position that Aveo occupies in it”. CEO Geoff Grady then reviewed the business and its sales. “Aveo has also transformed over the past five years to become a substantive healthcare organisation and underlying the importance of this is that we’ll deliver almost 750,000 hours of care this year”. “Adapting care as a central component of our offering wherever possible and producing cutting-edge retirement product sees us continuing to be Australia’s most innovative retirement operator”. “In FY18, we successfully delivered 506 new major units, with 456 deliveries in the second half. The deliveries were across eight sites, with the largest volumes at Newstead (Brisbane) in May and Bella Vista (Sydney) and Tanah Merah (Brisbane) in June”. “In terms of the Established business profit for FY18, DMF/CG and profit contribution were down broadly in line with the reduced sales volumes we saw – a direct function of the adverse media largely in the first quarter’. “Sales in the Established business were down by 38% and the portfolio sales rate fell from 10.9% in FY17 to 7.5% in FY18. We expect the long-term portfolio sales rate to return to 10% – 12% by FY20. “In August we indicated that ‘provided the market does not deteriorate significantly, we expect to write a minimum of 1,500 sales – 1,000 resales, buyback sales and minor developments and 500 new stock sales’. “Since mid-August the residential market has softened considerably”. “The clearest marker of this for Aveo is the weighted average auction clearance rates in the markets that we operate in – Brisbane, Sydney, Melbourne and Adelaide which for the first six weeks of Q2 had clearances of an average of 44% – finishing… at 43% last week but hitting lows of 36% in Week 13 and 39% and Week 18”. “That’s against an outcome of 54% in Week 6 when we reported in August and an average 49% for Q1 and 54% in Q4 FY17”. “Backed by the inexorable growth in demand in the retirement sector, our innovative products and more targeted digital marketing, bookings to inspect our units and seen appointments continue to grow and are now running at the highest level seen for some time – Week 18 for example ran at 203 bookings made”. “To achieve 30 sales per week we generally require between 180-200 bookings per week and we’ve achieved this in four of the 19 weeks of this financial year; three of those four weeks were consecutive weeks in the past month”. “Negativity around residential markets will however both constrain the number of sales able to be written and the time to affect settlement timeframes. This has been particularly noticeable in Sydney”. “Extrapolating the current sales run rate, it is averaging 22 written sales per week, for the remaining part of the financial year, implies an annualised rate of circa 1,150 sales which is up from 974 reported in FY18, however it is obviously lower than the initial 1,500 target we discussed with the market in August”. “Demand for new stock is now expected to be circa 275 units in FY19 up on the FY18 sales of 225. FY20 production will be scaled back accordingly to approximately 200 units as we sell down the accumulated new stock”. “Despite all the difficulties of the past 18 months, our mood is cautiously optimistic”. “Due to current market conditions and uncertainty around future sales levels, management will not be confirming FY19 EPS guidance today”. Perhaps in anticipation of this result Aveo’s stock price has dropped nearly 20% in the past four weeks. Yesterday it traded at $1.64. This compares to $3.60 in the weeks before the 27 June 2017 Four Corners/Fairfax devastating media campaign against retirement villages and Aveo in particular. As a direct consequence Aveo and Stockland are both seeking capital partners. Lendlease has already secured a 25% partner.